Nose: Honey, apricot, coconut, caramel, fruit cake and raisins. Then develops into nose of rose, orange blossom, nutmeg and ginger. Palate: Expect notes of dried fruits such as baked pear, muscat grape and pineapple soaked in Sauternes, gently toasted nuts, wildflowers and spring blossom. Finish is long and fresh with minty notes, then fresh tobacco. 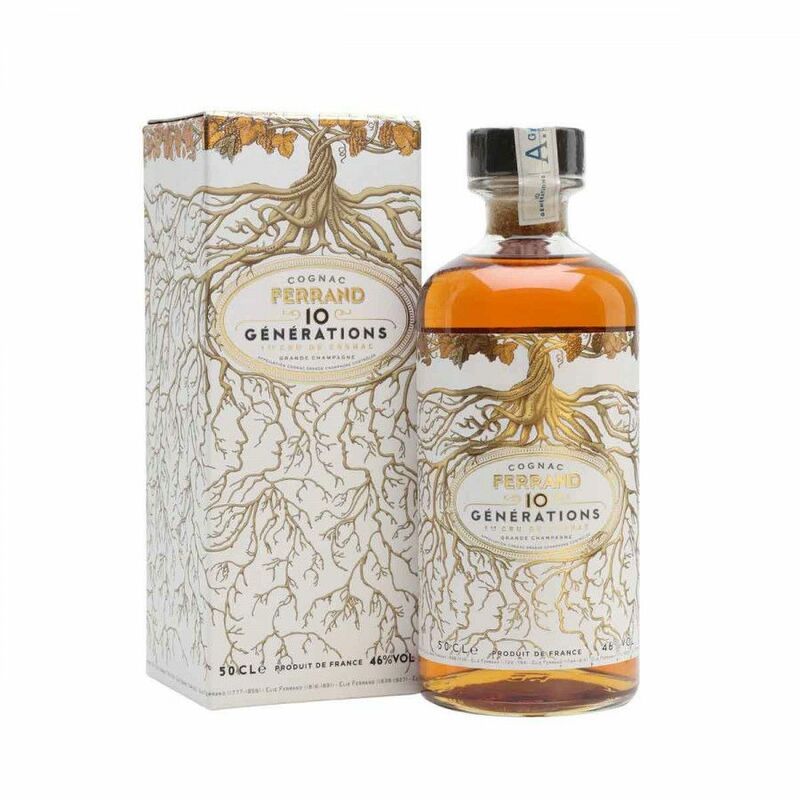 A fitting tribute to each generation and savoir-faire of this Cognac house, the Pierre Ferrand 10 Generations Cognac is a premium blend from the Premier Cru, the Grande Champagne. Arriving in an intricate traditional decanter illustrated with their family tree, it is a wonderful collector’s edition. Each of the ten generations of Cognac masters have added a unique twist to the knowledge of the vine and distillation; transposing their own character and graft into the precious nectar. Created using Ugni Blanc grapes grown in the Grande Champagne, its finesse comes as no surprise. The optimal maritime climate combined with chalky soil and limestone means that the light, floral nature of eaux-de-vie is highly desirable in a Cognac. Distilled slowly on the lees, the eaux-de-vie are aged in French oak casks, with 20% of the spirit in Sauternes barrels. Mademoiselle Henriette was the last direct descendant of such precious lineage, and she was indeed the guardian of its heritage. She is the inspiration for this fine 10 Generations blend. Fresh flavors and aromas, a decadent Cognac. The bottle and box are intricate and unique; you will adore the golden family tree that winds around the box and traditional decanter. It is bottled at 46% ABV per 50cl decanter. A true collector’s item. Serve with cocktails or for sipping. The nose isn't that great but this cognac is very smooth, very sweet on the palate. The bottle design and packaging is amazing! Be aware it's only half a litre and not 0.7 or 0.75 litre. So it's not as cheap as you may think.. Solid product by Ferrand! The estate of Cognac Pierre Ferrand is located directly in the ‘golden triangle’ of the Grande Champagne region of Cognac and is owned and run by Alexandre Gabriel. Specializing in old and very old cognacs, Pierre Ferrand is only bottled and shipped to order. They have also developed some unique production techniques of their own that are used in the aging and distillation process and have introduced innovative ways of collaborating with smaller scale producers. Both the vineyards and company headquarters are located in the 18th century Château de Bonbonnet at Ars, just 10 kms from the town center of Cognac itself. The producer reviews 1840 *** Cognac as a "cognac that offers ripe, juicy grapes to the nose, accented with meadow flowers, notes of acacia tree blossom and a bracing hint of cedar. On the palate, it's warm with fruit notes yet still very clean. The finish shows lots of honey and spice." No tasting note on Pierre Ferrand 1914 Vintage Millésime from our side, but here is a review by Filbert & Gaillard: "Nice bronze colour, nose conists of dark fruits, remarkable freshness and finally a strong, solid rancio. In the mouth: Exceptional explosion of a wide range of fruit, fresh." Eye: Rich vermilion red colour. Nose: An equally rich mélange of rustic flavours. Notes of leather, tobacco and walnut come to mind. Palate: Toasted almond with end notes of violet and vanilla. A spiced end note. Nose: Floral hints, and aromas of fresh pear, spices, and vanilla.